Me and Gareth have been talking about having an engagement party as a way to celebrate the special occasion in our lives with our loved and special ones celebrating with us. We're not going to be having a quick wedding but rather a long engagement giving us the opportunity to save and plan in advance rather than rushing into things and ending up with a service we don't want. With a beautiful ring on my finger, and big smiles spread across not only mine and Gareth's face, but Spud's too, an engagement party has been the talk of conversation quite a lot in these last few days. As you get older, you realise that the friends you thought you would have forever don't actually last forever, and in time you realise many of those so called friends are socialites, and not in fact friends. My big brother Paul threw a stunning Afternoon Tea party for a poorly relative, I could rope him in for help! With that in mind, I doubt we'd need to hire a hall out, and we wouldn't have enough people to fill it. 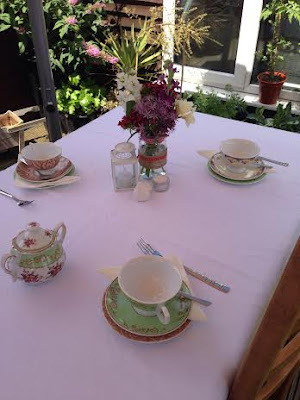 At the end of the day, this is a special occasion in our lives, and one we'd like to share with close ones only, so we may possibly be able to have it at my house, and if the weather is shining, we could have a garden tea party as my garden is huge! Inviting guest is most probably going to be the most easiest part of the planning, we both know who we would like to celebrate the day with us, and will not allow for anyone and everyone just for the sake of it! The majority of my family all live local, apart from my mum, step dad and little sister, who live four hours away in Cornwall, so I'd need to give them enough notice and hope they can make it! Seeing my mum twice a year just isn't enough :(. In regards to food, I'm not the biggest of cooking fans, so food will be nibbly picky bits that don't take long to prepare and cook, nor long to fill a plate and digest! I'm thinking a selection of assorted sandwiches and rolls, sausage rolls and cocktail sausages, a selection of quiches, voile vaunts with different fillings, cheese and pineapple, cakes, crisp and so on! 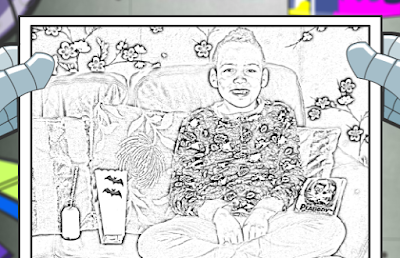 Thanks to Crayola, I could make guest colouring pages of themselves! As I did here with a picture of Spud! With Spud and other children attending, I may hire a bouncy castle to keep the children entertained, and set up a colouring table filled with crayons, pencils and colouring sheets to help keep them entertained! Sometimes the children get bored of bouncing around, and so I need to think of a few more things for them to do! We won't be hiring a DJ as the event will more than likely be held in my back garden, so my good old trusty stereo player, and a selection of party cds will do! We could play musical statutes and musical chairs with both children and adults, and have prizes for the winners! Chocolate bars for the adults, lolly pops for the children! I love the little miniture sets we've been collecting recently, just incase we do have an engagement party! With this kind of event, gifts are more than likely to be presented, and so I want to gift our guest back with something small, I have loads of bits left over for the kids to fill party bags, however for the adults what on earth would you gift them? 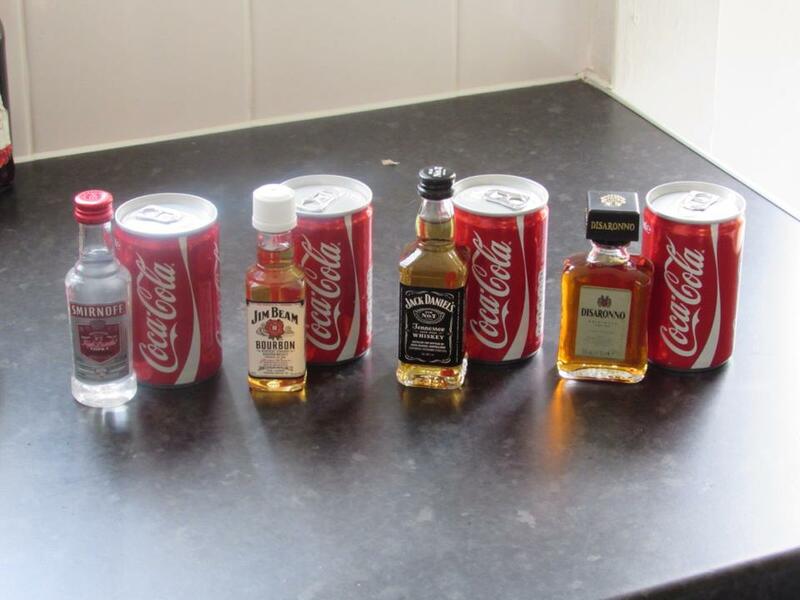 It's not as though adults will enjoy bubbles, no matter how mature the packaging is, and so I thought of the one thing near enough all adults enjoy - alcoholic beverages in the form of miniature drinks! I must also make sure my camera is fully charged, and may even check out the local job sites to see if any teenagers want to earn a few pounds to take pictures for us on our camera! I always see adverts for teenagers looking for ways to earn extra cash, and as I don't have a car they can wash, this could be a great way to help someone with good work ethics! Did you throw an engagement party? If so, what have I missed out!? Please do leave me a comment if you can think of anything that I haven't!